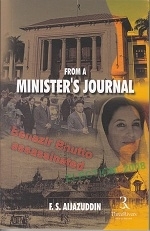 As a minister in the interim Punjab Cabinet in Pakistan from November 2007 to April 2008, Aijazuddin's brief but eventful term saw, amongst other things, the assassination of Benazir Bhutto in Rawalpindi. He records in his diary the chaotic aftermath including the brazen and clinical destruction of evidence at the site in full view of international television cameras. Less momentous but equally interesting is his documentation of the more routine aspects of political life in Pakistan. He describes how he conceived and, despite seemingly insurmountable bureaucratic hurdles, set up the City of Lahore Heritage Museum in the renovated Tollinton Market, adjacent to the famous Lahore Museum.